Thank you all for coming today to this ABC conference. I am Henry Takasugi, senior manager, in charge of the ABC project. I am happy to have this opportunity to speak to you. Today, I am going to introduce to you our brand new product. I am also going to speak to you about our state-of-the-art technology. I am sure that our new products will better serve your business objectives. More specifically, we are confident that our products will enhance your manufacturing productivity. Let me show you the agenda of this presentation. My talk today will have five parts. As for your questions, We can have a question session after my presentation. So, I would like to ask you to save your questions till the end of my talk. OK then, so much for the introduction. Let’s get down to the real business. Here is the conclusion of today’s presentation. Thank you, Mr. Chairperson, for your warm introduction. I thank you for taking the time out of your busy schedule. I thank you for this opportunity to present to you today. My name is Henry Takasugi, the Marketing Director of EFG Inc. The purpose of my presentation is to introduce our brand new product to you. It is also our purpose to introduce our state-of-the-art technology. By the end of my presentation, you will find how our latest products will further enhance your sales through increased customer satisfaction. This is what I will be presenting today. As you can see, my presentation is divided into five parts. As for your questions, there will be a Q&A session at the end of my presentation. So, I would appreciate if you would hold your questions until the end of the presentation. Now then, allow me to move on the main subject of the presentation. 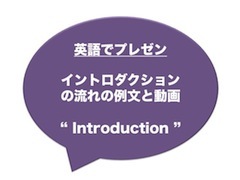 This is the main message of my presentation.